This book and its companion volume, Crusade against the Grail, are about as close as we can get to an “authoritative” statement of the esoteric dimension of the Nazi regime in Germany. The publication of the Crusade book in 1933 persuaded SS leader Heinrich Himmler to invite its author, Otto Rahn (1904-1939), to work for the SS as a folklorist. As the book under review here also does in part, that work developed the thesis that the doctrines of the medieval Cathars of Provence were encoded into Parzival, Wolfram von Eschenbach’s 13th-century version of the Grail legend. Rahn later became a member of the Ahnenerbe (“ancestral heritage”) bureau of the SS, in whose employ he finished Lucifer’s Court. It is generally conceded that Rahn’s death by exposure during a winter hike in 1939 was a suicide forced upon him by the SS, because of rumors of homosexuality, or of Jewish ancestry, or both. Nonetheless, Himmler thought highly enough of this book to order a special edition of 5,000 leather-bound copies to be printed during the war; for distribution, presumably, to select SS personnel. Both of Rahn’s books have been translated from German into English for the first time by Christopher Jones. These editions include acknowledgements of support and assistance from figures prominent in what has been called the “the esoteric Right” or “esoteric fascism”. 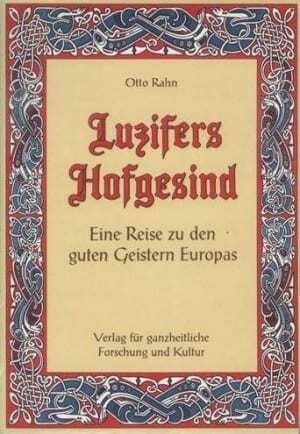 We may note that the title of the original, Luzifers Hofgesind, might more literally be translated as “Lucifer’s Courtiers,” and in fact some references in English to the German version have used that expression, or “The Courtiers of Lucifer.” This edition has Lucifer’s Court, the translator explains, because translations into other languages use some such title. A minor point: the original subtitle, at least in the German edition I have been able to locate, is “eine Riese zu Europas guten Geistern,” which is “a journey to Europe’s Good Spirits.” The English subtitle of this edition suits the content better, but the author did not think of it. The differences from the film are even more interesting, of course. The Grail for Rahn, to the extent that he considers it a physical object, is the German Grail, the Stone that fell from Heaven in Parzival, rather than the cup associated with Jesus in the Anglo-French Grail stories. The film was devoid of references to the Cathar sect, as indeed was everyone else’s understanding of the Grail legend until the middle of the nineteenth century. Also unlike the film, the book is virulently, relentlessly, jumping-up-and-down anti-Christian. It is particularly anti-Catholic, so much so as to reduce the antisemitic implications of its rejection of Yahweh to a mere subtext. In Crusade against the Grail, Rahn seemed content to accept the Cathars’ view of themselves as the true Christians (a view that Hitler seemed to share, if we may believe Otto Wagener’s Memoirs of a Confidant). In this work, Rahn has become more radical. If the Cathars considered themselves Christians at all, then they were mistaken. Lucifer, properly understood, is the hero of the story. The sections of the book, all undated and very brief, are headed by place names; the author tells us what he saw or felt or did at each location. The sections are arranged in three groups. The first deals with the author’s visits to cities in France, chiefly sites associated the Cathars and the Albigensian Crusade that destroyed them. The second group includes trips to northern Italy, Switzerland, and southern Germany. The third begins in the author’s native Hesse in Germany and then moves in stages on a trip that leads across the North Atlantic to Iceland. The organizing principle appears to be that the medieval drama of the Grail was played out in the South, but the meaning and perhaps the origin of the Grail is to be found in the furthest North. The North is key for Rahn, both as a symbol and as a source of historical influence from pre-historic times. How have you fallen from the heavens, O glowing morning star; been cut down to the ground O conqueror of Nations? In this way, I am hoping my readers will appreciate the story of those who sought justice regardless of the Mosaic twelve commandments and from their own sense of justice and duty; those who, rather than ever arrogantly expecting assistance from Mount Sinai, went to a “mount of the congregation, in the sides of the north,” in order to bring solace to their kind; those who placed knowledge above faith and existence above the light; and, not least, those who recognized that Yahweh could never, ever be their divinity and Jesus of Nazareth could never, ever be their salvation. In Lucifer’s house there are many dwellings. Many paths and bridges lead to him. There are mysteries in that passage, not the least of which is that the Decalogue seems to have sprouted two new commandments. Actually, there are mysteries intentional and otherwise throughout the whole book. Rahn often quotes slabs of text without citation, a deficit that his editors do not always supply. There are questionable specific points. As the translator notes, Rahn’s grasp of mythology was not above criticism. The Argonauts, for instance, whose adventures in Rahn’s imagination seem to have occurred largely in the North Atlantic, are said to have gotten their name from the town “Argos,” rather than from the name of their ship. More serious is the question of whether and to what degree Rahn’s thesis is supposed to relate to history at all. There are similar problems with Rahn’s understanding of the Cathar heresy as a whole. Catharism is actually a blanket term for a range of sects and beliefs which had some currency throughout Europe. The Cathars of southern France were called “Albigensians,” after the city of Albi. Rahn does not make these distinctions, and since he is concerned with Cathars elsewhere, particularly in Germany, we will use that term. Catharism is one of those doctrines we know only from the accounts of its enemies, so reconstructing its actual content has always been difficult. (For the incautious, Theodore Roszak’s novel, Flicker (5), may not be too far off the mark.) The Cathars seem to have been Manicheans, in the sense their theology was like that of the third-century Zoroastrian would-be prophet, Mani, though they may not have knowingly looked to him for inspiration. Manicheanism is a kind of dualism, holding that there are independently existing good and evil principles. In the Cathar version, this world, the world of matter, is evil, and Yahweh of the Old Testament is its god. In some versions of this kind of speculation, the Creator was an inferior entity, sometimes called the Demiurge, and his Creation was defective. It is not clear how much of this the Cathars believed, but none of it would have been original with them: the Christian heretic Marcion had jettisoned the Old Testament as the work of the devil in the second century. For him, the New Testament, or part of it, is the revelation of a good, alien God. This God did not create the world. His messenger was Jesus, according to Marcion, though as we have seen, Rahn thought otherwise. The Cathars seemed to have believed that Jesus was never really material, and that he was never crucified. They further rejected the Church hierarchy and its system of sacraments. They had a sacrament of their own called the consolamentum. Those who received it became perfecti, Latin for “Perfect Ones” (Cathar is Greek for “pure.”) Most Cathars received it on their deathbed; those who took it earlier became clergy. Perfecti pledged to vegetarianism, and not to take life, and to celibacy. Birth was an evil, since the entrapment of human souls in matter was one of the things Catharism was supposed to help remedy. The Cathars seem to have believed in a cycle of reincarnation which, like the Buddhists, they sought to escape. Ordinary believers, who had not yet become perfecti, could and did function normally in medieval society. Among them was the bulk of the aristocracy of Provence; hence Rome’s campaigns, first of evangelization, and then of crusade against the Cathar strongholds. To this account of possible Cathar doctrines Rahn adds and subtracts with perfect freedom. Cathar anti-natalism and horror of matter disappear entirely: rather, in his account, it is the followers of Yahweh who are hostile to the natural world. There are ancient doctrines which make a hero of Lucifer, or at any rate, of Satan: Rahn mentions more than once the old notion that Lucifer is simply in exile from Heaven, and will return in due course. In the section entitled “On a Southern German Road,” Rahn sets out a vision, or a profound meditation, in which he is instructed in the role of Lucifer as an intermediary, or role model, by a Cathar named Bertrand of Foix. It is not at all clear that the Cathars ever thought any such thing, however. We may note that, after the meditation, he camps with a group of Hitler Youth; they are Courtiers of Lucifer, too. Rahn’s investigations into Catharism tend to merge into other interests. Rahn was a member of the vцlkisch wing of the Nazi movement, along with Himmler and Himmler’s personal wizard, Karl-Maria Willigut (also known as “Weisthor”). Rahn followed up references to what in English-language folklore studies is sometimes called “the fairy faith.” He describes how medieval heroes gained immortality by finding the mountaintop rose-garden paradise of Laurin, King of the Dwarfs, a notion he conflates with the mountaintop paradises of Asgard and Olympus, and with that northern mountaintop to which Isaiah says Yahweh is so keen to restrict access. The Courtiers of Lucifer in the West may have been nominally Christian, but they actually hoped to go after death to the “bosom of Arthur,” like Shakespeare’s Falstaff. Shakespeare was in on the secret, too, it seems. As for the Grail, Rahn’s accounts of it vary as much as the descriptions of legend. Parzival introduced the idea that the Grail Stone had been brought to Earth by angels of ambiguous allegiance. In later developments of the story, the Grail is a jewel that fell from the crown of Lucifer. Rahn likes that expression and uses it repeatedly. As many commentators on Rahn have noted, stones do sometimes fall from the sky. There has been considerable speculation that Rahn may have been seeking, or actually helped recover, a meteoric Cathar relic on his spelunking expeditions to the south of France. However, in the section of this book under “Halberstadt,” he views what is apparently an actual meteoric stone. Called the Teufelstein, the devil allegedly threw it at the local cathedral when it was under construction, in an unsuccessful attempt to prevent the cathedral’s completion. All Rahn says is that “Christians will believe anything.” It is not over reading the text, perhaps, to infer that he is signaling the reader not to make the Grail-meteor connection. By and by, in fact, we learn that maybe we should not take the connection between historical Catharism and Luciferian liberation too literally, either. Rahn mentions a Persian tradition about a holy stone that parallels Parzival’s Grail story in essential ways. In fact, he suggests that “grail” may be derived from the Persian word for the stone, “ghral”. The same illumination came to two groups of Aryan peoples, one in Western Europe and the other in the Near East. The familiar Grail story is just one manifestation of it. The quest of the Argonauts for the Golden Fleece is, in some ways, the same story. This illumination is connected with the recollection of a time when the far north was warm and hospitable, and a healthy sort of mankind lived in harmony with nature. The name “Hyperborea” comes up. By Rahn’s own account, his wanderings were always destined to end in Ultimate Thule. The point has never been the recovery of an empirically verifiable historical tradition. Rather, to use a term that Rahn (or this translation) does not use, Rahn realizes that he has been seeking to clarify an archetype. Or perhaps that term is too easy. In the section under “Runkel an Lahn,” Rahn presents a vision in which the divine is generated by the struggle between life and death. By rising above their individuality and embracing this struggle, heroes can hope to attain a genuine immortality by entering the mythical realm. Readers may be reminded of Julius Evola’s description in Revolt against the Modern World of the mutual permeability of chronological and mythological time. The difference is that Evola’s criticism of Nazi mysticism as stultifyingly chthonic seems to apply to Rahn’s ideas: the volkisch worldview is oriented toward the folk soul, rather than to eternity. The fate of the hero is less like apotheosis and more like psychic mulch. The Cathars may have been dualists, but Rahn’s ideas are not essentially dualistic. Dualism involves two universal principles in conflict. Rahn’s mythological version of history, in contrast, is a struggle between folk souls, actualized as a struggle between their gods. As it happens, there are just two such entities, Yahweh and Lucifer, that interest Rahn. They represent the Jewish and German (or Aryan) peoples and the struggle between them. However, one might point out that there is no particular reason why there should not be more than two, or more than one. This cosmic struggle is a historical accident; different only in scale, perhaps, from a fight occasioned by a chance encounter between dinosaurs. A long section of the book is an excerpt from Don Quixote, the story of the old knight whose mind was so addled by reading romances of medieval chivalry that he could no longer tell the difference between the stories and reality. Rahn identifies with Quixote, but not in the sense that either was really deluded. Rather, the stories that entranced Quixote, like the vцlkisch mythology that absorbed Rahn, are more real than the events of the everyday world. The events of the everyday world, both in the past and in the present, gain their meaning to the extent that they reflect the myths. Legends communicate a higher truth than does sober history. All these points come together, indeed perhaps the whole tale of the Third Reich and the occult comes together, in the section “Reykholt,” a place in Iceland. Rahn takes care to emphasize his disappointment with Ultimate Thule, the place to which he believed the remnants of ancient Nordic culture fled to escape the Christian infection, and perhaps the last piece of a primordial world that existed before all known history. Iceland as Rahn encountered it, however, was treeless; at the summer solstice, it was not so much nightless as shadowless. Reykjavik the capital was a town of corrugated-iron roofs and concrete walls. The locals were friendly enough, but there seemed nothing to connect this shabby country with the world of the Eddas, Elder or Younger. Rahn does manage to do some hiking, apparently with another German, who may also have been another SS man: the circumstances and purpose of Rahn’s visit are not described. The two climb a cliff and settle down to admire the view. The companion delivers a lecture. Much of this discourse expands on the relationship we have just considered between myth and history. Where something divine or celestial strikes the Earth, we are told, a horde may turn into a people. Culture is the striving of the Earth to reach Heaven. Heaven and Earth meet at the point of sacrifice. In a healthy world, the sacrifice is perpetual, a relationship of balanced flow between high and low that unites man and nature. The story of the world since the triumph of Christianity, however, is the story of the consequences of the interruption of that flow. The myths of northern Europe reflect the coming of the current dark age; they also foreshadow its ending. The twilight of the gods was at the same time the dissolution of tribal loyalty to the gods, heroes, and the almighty forces of nature...In place of mythical divine wisdom, a ritual mechanical intellect has assumed its place in the ‘me’-addicted world of things...The mythical world of prehistory also saw its destruction in the final battle of the gods...Odin was eaten by a wolf...We should remember that Rome’s mother was a she-wolf...Odin’s son, the silent Widmar, killed the wolf in yet another act of revenge. As it says in the Edda, Baldr returned and announced to mankind the divine mystery of the earth and the cosmos: ‘On Gimil’s heights, I saw a room brighter than the sun and decked in gold. Worthy lords must live there...’ What is that strength from above that conquers the power of death and hatred? Who can awaken a very lonely mankind after the twilight of the ‘me’-addiction, so that we can rebuild society in selfless service, taking care not to destroy freedom, but to heal it? Readers will note that, like the Evolan version of Tradition with which it shares many points, this is essentially a revolutionary project. Despite Rahn’s devotion to European history and mythology, one cannot help but notice that the center of almost every place he visits is a church; a church he hates, either for its architecture, or its history, or the presumed greed of its incumbent clergy. When the myth is the reality, then the visible sticks and stones, and flesh and bones, become not just expendable but intolerable. I have been studying the Third Reich and the occult for 30 years. This book pretty much sums the subject up. Otto Rahn – Otto Skorzeny Raiders of the Found Ark?